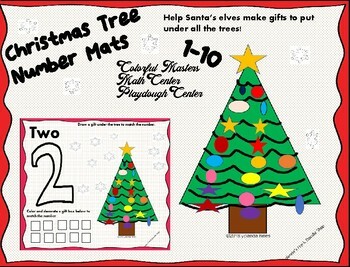 Fun colorful interactive Christmas Tree mats! Loads of fun in the playdough, and math centers! 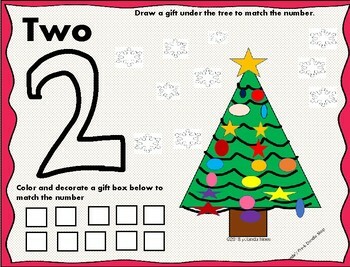 Student will get to help Santa's elves create gifts to go under tree by drawing gifts to match the numbers. 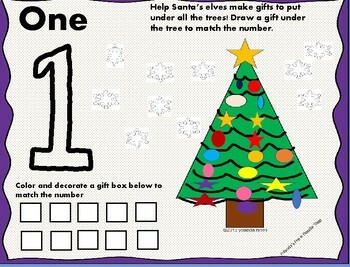 Each Christmas Tree mat includes a colorful Christmas Tree with numbers 1 – 10, with the numeral and number word, and with blank separate ten frame boxes used for counting and coloring. Ten frame boxes are separated in this activity to help give space for coloring and decorating the boxes as gifts. It was a fun activity for my students. Some students used crayons, or markers for drawing, and some used playdough, stickers, or other counters to match the number on the mat. Student used playdough to make the number shapes and shapes on the trees and to make gifts. Students will draw gifts under the tree to match the number or students can place stickers under the tree to match the numbers or playdough can also be used. Crayon or playdough may be used to decorate the gift boxes. The gift boxes represent each gift that the students will help Santa's elves make. The colorful Christmas Tree Mats make great winter activities! The mats are 8.5” x 11”. You may print in color, black and white, and on colorful cardstock paper. Also laminating the mats will make them easy to use and last longer. Great for group play or independent play! !